Backgrounds the important basics of sailing, an ideal Christmas or birthday present, and an ideal book for the beginner as well as a good reference for the course. This is the new edition of the book by New Zealand’s leading sailing school instructor and popular television yachting commentator. 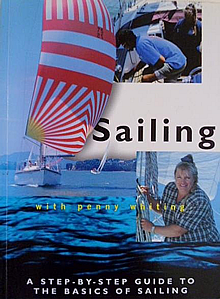 It shows in Penny's own style how to learn to sail a keel boat yacht. Covering every aspect of sailing, from the rig and parts of the boat, hoisting sails, running, gybing, going about, reefing, tying knots, and handling a spinnaker, this is perhaps one of the clearest, most user-friendly books for those going afloat for the first time. Lots of clear sequential photographs throughout. New to this edition are a short section for Optimist sailors, and the importing of much of her book, The Boat Code. This focuses on rules of the road, buoyage and suchlike. If posting overseas, please add NZ $22 to the price.